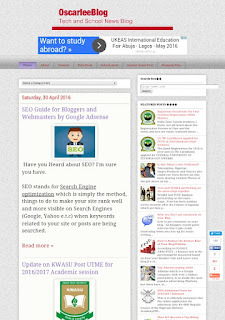 Hello my great zealmatblog friends, families and my fellow bloggers and also our team we are happy to present to you the blog of the week which is Oscarleeblog a Tech and school News Blog with latest Updates of all Nigeria schools accompanied by Tech News and blogging tips and Tips on How students can make money online without much stress this blo is 5 months old created on April 24th with Alexa rank of 1.4M and well designed and mobile friendly with good desktop design. Oscarleeblog is a blog were you can get the latest and trending cheat for glo, mtn, etisalat and other software terms and conditions including some tutorial on how to use any new gadget. Hello Oscar Lee your blog is perfect and try to put more effort in creating your audience and also don't focus on only Google Adsense and the sky will be your starting point congratulations once again.